Two Manga authors famed for introducing Asian readers to the world of fine wine have been named as the recipients of 2016’s Asian Wine Personality award from the drinks business and Vinexpo. Shin and Yuko Kibayashi were presented with the award by Patrick Schmitt MW, editor-in-chief of the drinks business, and Guillaume Deglise, CEO of Vinexpo, at a reception hosted jointly by the drinks business and Vinexpo on Wednesday, 25 May at Vinexpo Hong Kong. The brother and sister duo writing under the penname of Tadashi Agi, first created The Drops of God (神の雫 Kami no Shizuku), a weekly Manga series in November 2004 and the storyline follows Shizuku Kanzaki, the son of a recently deceased wine critic who competes against his father’s adopted son to take ownership of his father’s legacy of some of the world’s rarest fine wines over the last 30 years. The series and the following TV adaptation not only ignited a love of wine among the young in Japan, but across the world. Such was the effect upon the readers that each of the wines mentioned – for example 2000 Château Palmer; 1992 Château Lafleur and 2000 Marc Colin Montrachet – saw demand for bottles rise as avid readers followed the adventures of Kanzaki. Diners allegedly came into restaurants wielding a copy of The Drops of God, asking for the same bottle. The last volume (volume 44) was published in June 2014. The manga has been translated in more than five languages including various Asian languages as well as English and French. Within Asia, the manga received wide readership across Japan, Korea, Hong Kong, Mainland China, Taiwan and Indonesia. This is the third time the drinks business and Vinexpo have presented the award. 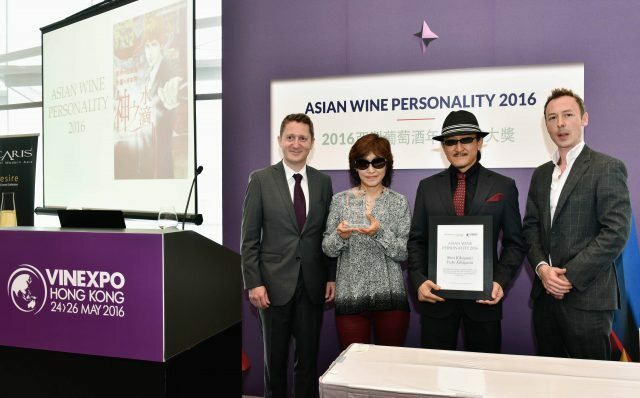 Vincent Cheung, the Asian grand maître of the Commanderie de Bordeaux was named as Asian Wine Personality at Vinexpo Hong Kong in 2014 and the first awardee was Judy Chan of Grace Vineyards at Vinexpo Hong Kong in 2012. Nominated by a panel of leading figures in the international wine trade, the award for Asian Wine Personality recognises outstanding achievement in promoting wine within Asia, whether through viticulture and winemaking, or sales and marketing.